You would be surprised how long they can keep it going. I thought it would have blown up years ago but here we are. There might be another couple of years left – maybe it goes to hell in 2020. Yes but now we are in a rising interest rate paradym. You’d have to be crazy to think that Trump would let the Fed destroy his economic credentials in 2019-20 heading into re-election. Trump and his man Powell gave got this. Feels a bit like 1997-1998 again where the Fed is raising rates after a long expansionary period, and the strain is being felt in weak EM economies like Russia, Turkey, Argentina etc that are currently being blown up. So long as the yield curve is normally shaped, I’m staying put. Trump’s sword of tariffs against historical unfair trade deals is probably a big factor too. 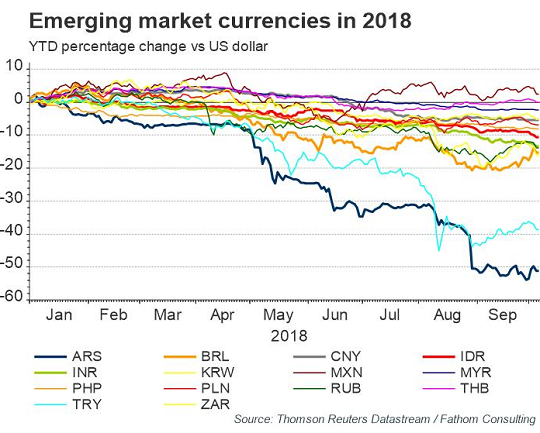 Not only are EM hit with rising US$ interest rates, but the opportunity cost of profitless investments (Uber, Tesla, Netflix, BlueApron, Lyft, Snap) is also increasing. What does that mean? Can you elaborate a bit on what the opportunity cost is? The opportunity cost between any two investments is the difference in the return on the two investments for the same period. Example: Investment A is worth $150; over the same period, Investment B would have been worth $200. The opportunity cost to invest in Investment A is $50. As interest rate rise, returns on lower risk investments increase; the “opportunity cost” of a failed “get rich quick” investment increases. If l had any investments I’d be getting worried….. Yes, and soon the USA will chase the MSCI down the hill and have so much fun the red line will end up on top! Great reading this with the charts. Thanks. ….you can always worry about worried investors if you want, they get up to all sorts of crazy stunts when they think they’re going to lose. Otherwise just learning to keep a straight face is wise advice I think. The S&P 500 dividend index is at 1.81%. Why not buy three month treasuries yielding 2.2 % and roll them each time there’s an interest rate increase? How much more capital appreciation upside does the S&P 500 have with a BPI above 70%? It may stay overbought longer than one could presume. Companies have been buying back their stock reducing their shares outstanding, which incrementally increases their dividend without increasing revenue or income. The corporate tax windfall of 21% has been used to buy back shares along with debt. Hopefully, they’ve locked this debt in with low interest rates and long duration, if not, they will be rolling this debt at higher rates sooner rather than later and this will impact the dividend. Because you’re guaranteed to lock in a rate of return that gives you your purchasing power back – no more, no less. There’s no opportunity for upside. When the default position is to be in the market, and it appreciates another 20% next year, you effectively have lost 18% if you sat in 3 month USTs. I doubt that hot-money investors will find this to be much of a problem after covering some short-term losses. They’ll just cycle out of EM markets into DM markets, causing them to surge. But it will be interesting to see the reactions when US equity markets continue upward even as the US economy goes into recession. That will take some explaining and provide an opportunity for certain parties to demonstrate some real creativity. In unrelated news, contrarian investors took the opportunity to short Tesla big time after Musk flamed short-sellers, which I’m sure proves something. I’m just not sure what that might be. 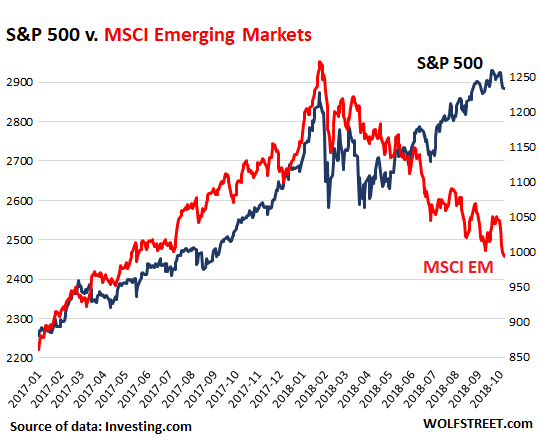 Just one year ago there was high pressure sales tactics from Wall St to invest in “emerging markets” (EM). Of course, Wall St knew already very well what FRB announced policy would both raise short-term interest rates (FOMC dot plot) and raise long-term interest (QE unwind announced and starting). So Wall St was ready to unload their EM stock and debt holdings onto the unsuspecting. Following that logic, what are they selling us now, that we should therefore avoid? 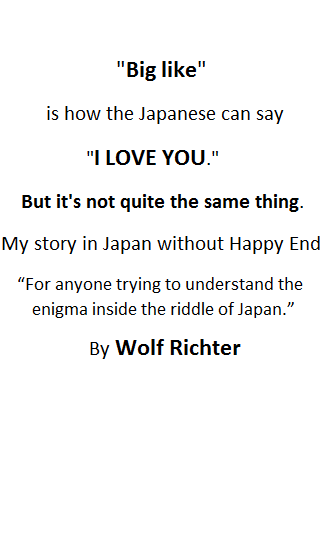 I wish it was that easy to see. I had a gut feeling about the buy-EM advice, but I had not figured out WHY yet, at the time. I did not know that so many EM debtors had USD-denominated loans, for example. Then again, we are in the everything-bubble right now. The real question is in what order the various risky dominoes are lined up to fall. It is not so easy to predict. Any good insights out there? Go do a search of articles and advisers a year ago and see which ones were really pushing the EM buys hard. Now, go read what those same advisers are pushing now. And it goes without saying to avoid whatever they are pushing now. The list of people who were pushing this a year ago when the hucksters were pushing this hard will give you a list with two types of names on it. Who’s just an agent for the hucksters pushing whatever they want pushed. And who just isn’t very bright so they went along with what the agents for the hucksters were selling. Either way, you now know to avoid whatever these two groups are pushing now. 1) The overseas pain will continue until the Fed backs off on the QT. The natural progression would be for distress to spread from the weakest borrowers to merely weaker borrowers. It will start to infect US borrowers who can’t cover the interest out of free cash flow, and can’t easily refinance. But it will also show up in unexpected places because there’s so much debt, so opaquely structured, that it’s hard to tell who owes what to whom. 2) If you see something in free media, the advertisers want you to see it, and it’s probably factually wrong in at least one major respect. Investors tend to herd around the media spotlight – and that will be used to fleece them. Wolf is great but even he obsesses about Tesla, although it’s hardly the worst basket case out there. 3) Risky dominoes hide even in “safe” funds. For instance, “Prime” money-market funds and 401K “US Bond Market” bond funds appear to have been quietly loaded with USD-denominated loans made to non-US end-debtors. (a) Fidelity’s US Total Bond Fund carries a healthy slice of PEMEX debt. (b) The Vanguard Prime Money Market Fund is 57% “Yankee/Foreign” i.e. Eurodollar loans (i.e. loans made to organizations outside the US). The holdings list reads like a whos-who of international banking. Note that as part of the post-2008 reforms, prime funds are not guaranteed to hold value, they can “break the buck” now, that is the share price doesn’t have to stay $1.00/share. So in fact investors can lose money even in money-market funds, if a large enough share of the loans go bad at once. Fortunately “normal” investors have been herded into US government debt-based money market funds, that don’t carry this risk… which has probably helped to fund US national debt… but those seeking the extra yield from the Prime funds may find that it came at a price. I’m interested in ways to monitor the stress in the overseas dollar markets. In 2006-2008 the “TED Spread” (Treasury-EuroDollar spread, i.e. overseas-USD interest rate minus Treasury rate) was really useful. Not sure how reliable the data is now, though. But the credit markets are usually “smarter” than the equity markets, so watching spreads generally is helpful. South America is worth watching also, for what is already known , plus the Brasilian election might lead to unrest…and that is all possible contagion to Europe and US. Equally the US might have its own market problems, but those are somewhat known so I don’t think the US is going to be main catalyst…tech trouble and housing/slowdown seem most obvious to me but the first is almost run of the mill, and the latter takes time… but who knows , I’m just rambling out loud coz you asked, probably without helping really :-) . They are trying hard to sell a recession in 2020. I must have heard 20 pundits say that again and again. Do they want you to hold your investments until 2020, while they start liquidating their own portfolios today? Hussman just said there is no warning to a recession. It happens vary fast. Things can turn on a dime. He is one of a few stock analysts that actually back up statements with analysis, not simply conjecture. In a sense they happen before they start even, and by the time they are measured the market is a different place. To me the 30yr yield gives a stronger trendline, and so the limits, but a lot of effort has been taken (sic) to make this time different….just like the other times….or not? These are huge things, run by fast-acting robots and once there is a significant drop in the market, the simultaneous unwinding of all their holdings to “weather the crisis” will be a ‘BoooM’ visible all the way to Alpha Centauri :). or at least it will be Circuit Breaker Time. It resembles Doug Noland’s periphery to core dynamics. If there is no contagion you simply reallocate to EM when valuations improve, and it’s a virtuous cycle. How much will trade wars take out of the global demand component? Does the bad EM debt denominated in dollars have a profound affect? Perhaps rates don’t matter, it’s all in the ritualistic way in which circular trades evolve, [he gives some pretty good examples in last weeks CCB] The daisy chain can break at any number of pressure points. ->How much will trade wars take out of the global demand component? I thought it was worth looking at the numbers. In the first eight months of 2018, China’s exports to the US were $344.7 billion. This is up by $25.4 billion from $319.3 billion in the first eight months of 2017. I’m afraid I have a hard time seeing how China’s economy could be hurt all that much from tariffs that still did not prevent its exports from rising year-over-year. More Trumper tantrums will be needed. I’m pretty sure the Pentagon outspent this figure. And for what good reason? Seems it could’ve gone to something productive. Gee, it’s a good thing we don’t have those conditions in the US. 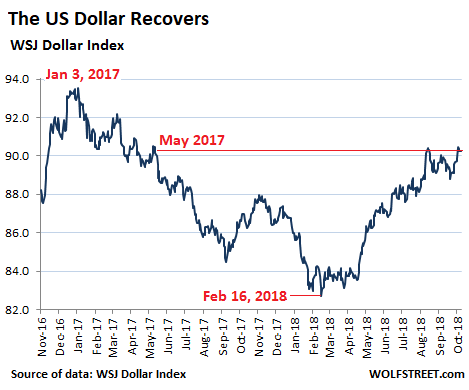 I believe the US is enjoying (and abusing) its position as THE reserve currency and that allows US dollar to be a safe harbor. But then again, in a race to the bottom/unsafest currency to hold, Euro and Yen aren’t holding anything back. Yep. The US has a huge trade deficit in part because people overseas want the dollars and tend to accumulate them. If they didn’t do that the dollar would weaken and US exports would be more competitive. Not only do they want to accumulate dollars, but they borrow even more in dollars as well, so “Eurodollar” or overseas loans are a huge thing as well. In turn, the US government actually has to run a fairly large deficit, to supply those dollars to the world, in order to avoid domestic deflation. I would think the next bubble would be small automation firms. Think 1985-1986-1987 when 3-men-companies were selling bat-file-wrappers around PC application programs they could license cheap. Cheap PC, cheap application software, bat file made it a proprietary product. Equivalent now would be low-code-wrappers to let a smart-phone be a control-panel-via-Bluetooth to control/program a robot or automated machine. The low-code would make it proprietary product. I agree. Buy what is hated most, and a year later, you will likely be rewarded. Buying VWO makes me sick, and that is the time to buy, since nobody thinks it’s a good idea.